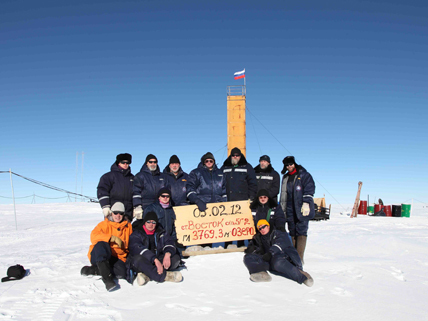 Scientists at the Vostok station hold a sign proclaiming their achievement. Much of Antarctica is covered by a vast sheet of ice. But Antarctica also has liquid water. Hidden under the ice, Lake Vostok is the largest of hundreds of subsurface lakes. Vostok lies more than 13,100 feet below the surface of the ice. The ice above the lake is so thick that the margin where ice meets Lake Vostok’s fresh water is some 1,600 feet below sea level. Vostok is about the same size as Lake Ontario, but much deeper. Although a nineteenth-century scientist had predicted that fresh water could be found beneath the Antarctic ice, the lake’s presence was not confirmed until the 1970s, when remote sensing technology made the discovery possible. Another important discovery was made February 5, 2012, when Russian scientists drilled down through more than two miles of ice to finally reach the liquid surface of the lake. Among the topics they want to study are the microclimates encased in the ice column that the drill brings up. Scientists can track the history of the planet’s climate in these samples. Microorganisms have already been found in the ice cores. Further study of these hardy bacteria can reveal more about the survival of life in extreme environments. Lake Vostok may even provide clues to the chances of life elsewhere in the solar system. Could anything live in Lake Vostok’s frigid water, which has been sealed off from the rest of the planet for 20 million years? In 2013, scientists plan to send a robot into the water to collect samples. If any life forms are found, it would imply that life might also exist elsewhere in the solar system. Europa, a moon of Jupiter, and Enceladus, a moon of Saturn, probably both have liquid water under miles of ice. Both moons seem to have conditions similar to Lake Vostok and, therefore, would be candidates for places where life could be found. The drilling into Lake Vostok has been criticized by some scientists. The Russians have had to pour chemicals down the hole to keep the drill moving. These chemicals could contaminate the water. Using hot water instead is not feasible, though, because the technology to heat the water isn’t available at the remote Russian research station. ABC News reported on the story. View this video about the Russian drilling project that reached Lake Vostok; its soundtrack is in Russian, but the detailed diagram has labels in English. This news article gives a description of the process and dangers of the drilling effort. This article poses the question of what life forms may be found in the frigid lake and what they might tell us about the possibilities of life on other planets.
) an excited acnuonnement was made at lunch, the USSR had put the first man into space! The excitement died down later in the afternoon when Tass announced no, sorry, that was just a rocket, we were mistaken, no manned flight today . Heinlein had a point- when would the Soviet news agency EVER have been misinformed in that way? He hypothesized that there HAD been a manned spaceflight by the USSR that day, and perhaps it went bad. The USSR made it go away and tried again later, rather than admit they had a dead cosmonaut orbiting the earth (could he still be up there?). We’ll never know but it strikes me as plausible. AWESOME ARTICLE I THINK ITS GREAT!!!!! I have to do this for homework as well. This is very interesting. I have to do homework on this to and this is the best artical I have read this week!